The above painting was done, following the steps in the post found here. I used an eyedropper to draw the wolf paws but an ink nib to make a finer line on the human legs and feet. This piece was inspired by my sister. She wanted me to try to take my previous piece, re-draw it, and insert childrens feet dancing. She asked that I work with the color red indicating the first chakra energy. She wanted me to attempt to make the legs and feet of the human appear as though they blended with the reds of the background and not be as prominent as the foreground wolf paws. What I was striving for here was energy, earth, movement and union. I hope I have at least touched on some of these things. A sincere thank-you to friends and family who follow and give this blog life!!! This is the view of the same creek as here only it is looking west instead of east. 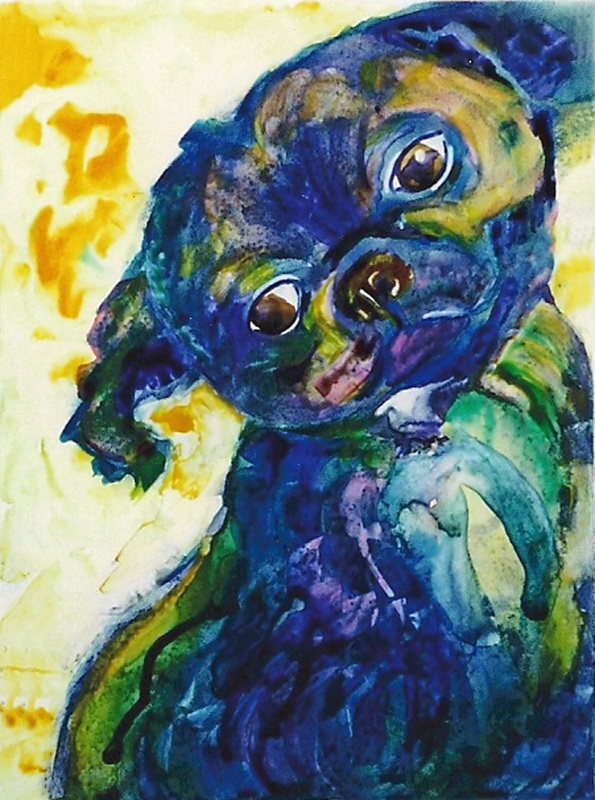 Have you ever tried using watercolor on Yupo paper? I am not very accomplished but do return to enjoy painting on this surface from time to time. I can only tell you that I jump right in and explore when I paint on yupo. I do not draw, first, but enjoy shaping the form in. I usually don’t get very far with the initial laying in of color. 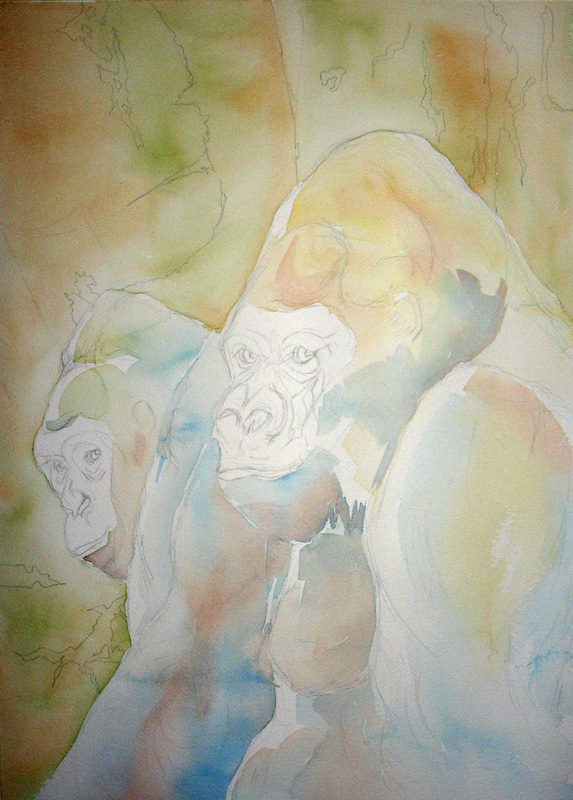 That comes, later as I introduce more and more color and begin to allow the water and pigments to mix. Because this paper is plastic, I use very little water. I enjoy lifting out mistakes with a damp brush and reshaping. I never quite know when I am finished but thoroughly enjoy time spent trying to work on this slippery surface. Sandrine Pelissier has shared some of her techniques here. And has a tutorial here. I learned about goauche resist, first, from Art Pearl’s site about a year ago. I have done several. It is a lengthy procedure but well worth the time spent due to the interesting images that can be created with it. I took the time to outline the procedure in the event that someone would like to try this. 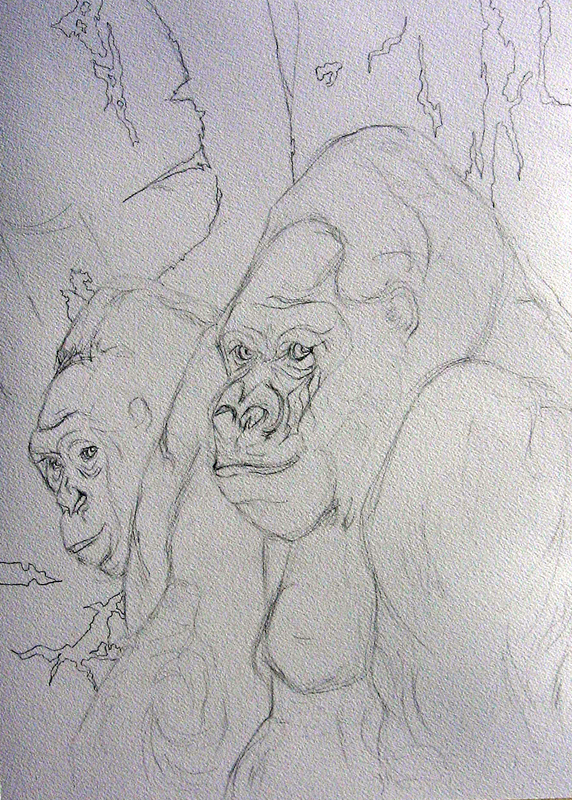 The above is the drawing from a photo of two gorillas I found on wet canvas. I thought it would lend itself well to this technique. I have used Arches 140lb coldpress paper for these but see no reason why rough or hot press could not be used. I do think it demands 140lb paper because it takes a beating in the process and lighter papers may not hold up. In the second step I ” LIGHTLY!” wash in some color. This aids in the application of gouache to the surface because it helps you to see where you have applied it. If you don’t do a light underpainting, first, you will need to continually tilt the work in order to see where you have painted the gouache. 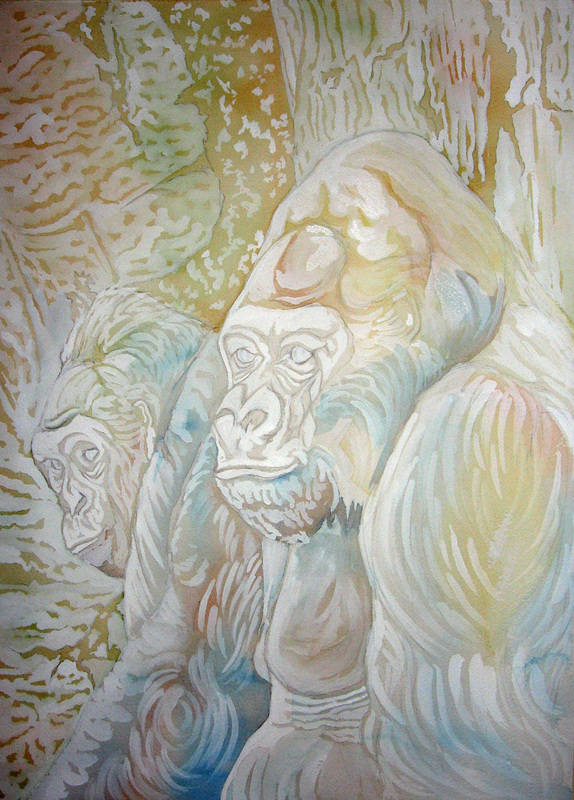 The third step involves applying white gouache to the portions of the painting that you do not want ink to settle into. I used permanent white gouache and added enough water to it so that it was creamy, not pasty. Too watery and you may not get enough coverage. This is the lengthiest step. I allow this to completely dry before going on to the next step (several hours, if not overnight). The next step is to cover the entire piece with waterproof black ink. I use a large, soft, flat brush, reserved for ink, in order to not contaminate my watercolor brushes. I start at the top and work down the piece ensuring good coverage. I “DO NOT” dip this brush in water during this part of the process as it will weaken and lighten the ink and possibly lift some of the gouache. Be patient and don’t stroke over and over the resist with ink while it is still wet as this may also cause some of the gouache to lift. I then allow this application to completely dry. The ink I use is fairly thick, so drying time for this stage is longer than for the gouache stage. After the ink is completely dry, several hours to overnight, I wash the piece under water and gently stroke the surface with a sponge. This washes off the gouache and the ink where it was applied. I have found that you can decide where to stop with this stage. More scrubbing reveals a lighter resist. Once again, wait until this stage completely dries before applying watercolor. I then paint the resist with watercolor. 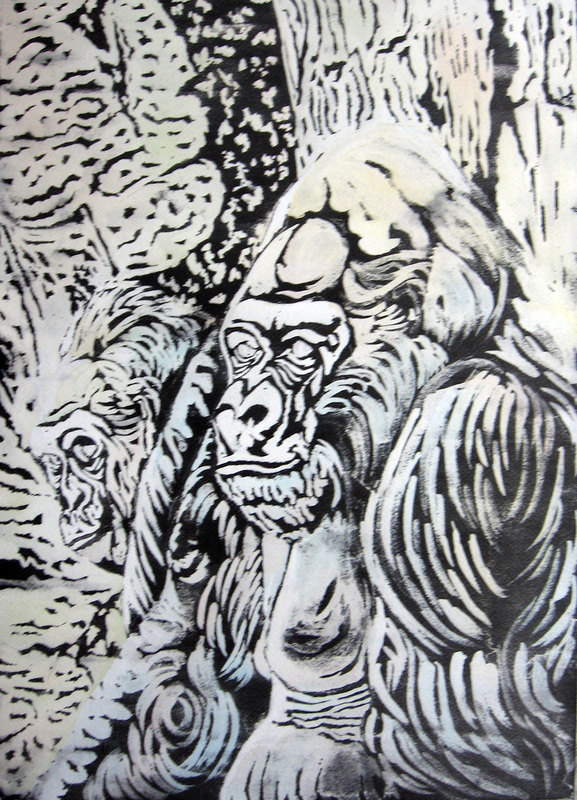 There is some back and forth with lifting and layering as some of the ink does run off into the paint leading to a more opaque or grayed-out appearance. I think what I like best about these is that it offers, yet again, a different look to works than had I simply painted this image start to finish. 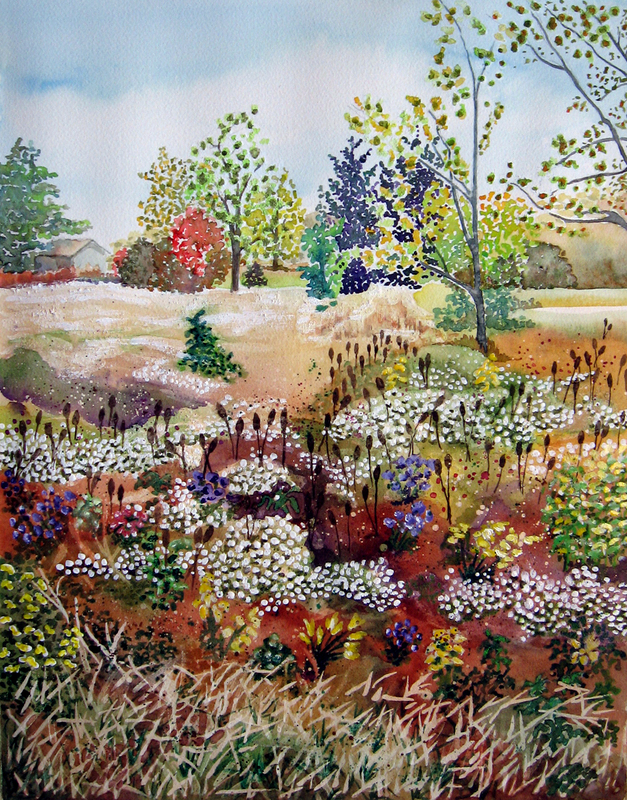 The above painting was inspired by a photo I took last July as the Queen Anne’s Lace began blooming where I painted plein air this summer. This is a view from standing in the shadows of the large pines to the north of the property and looking over the fence to the north west. The texture in the foreground shadowed area was created by painting and splattering with frisket in several layers as I painted in the darks. 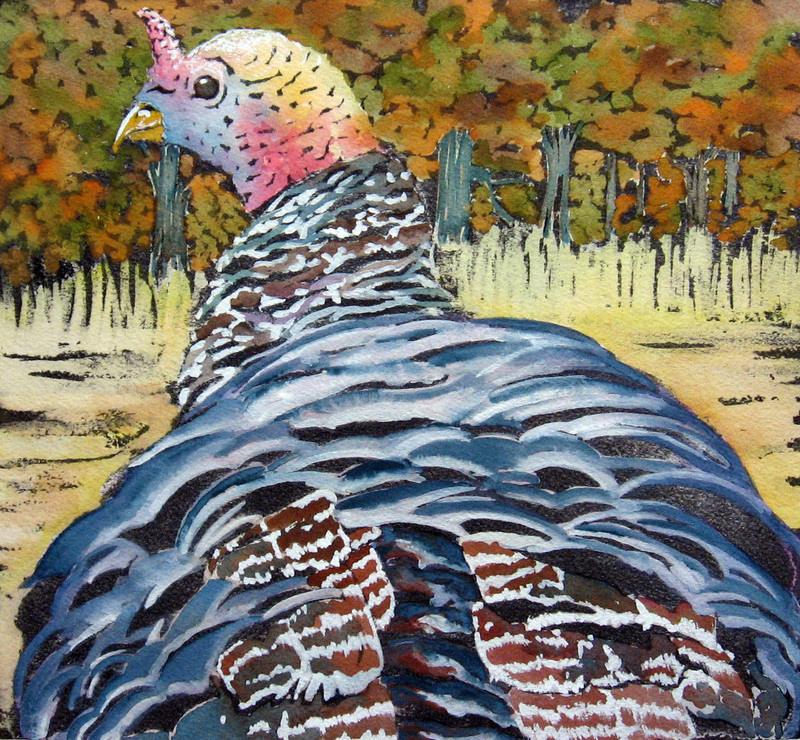 I am enjoying this project of painting Indiana and am noticing the beauty of my State through new eyes. There is so much to share at one small location. Oh! 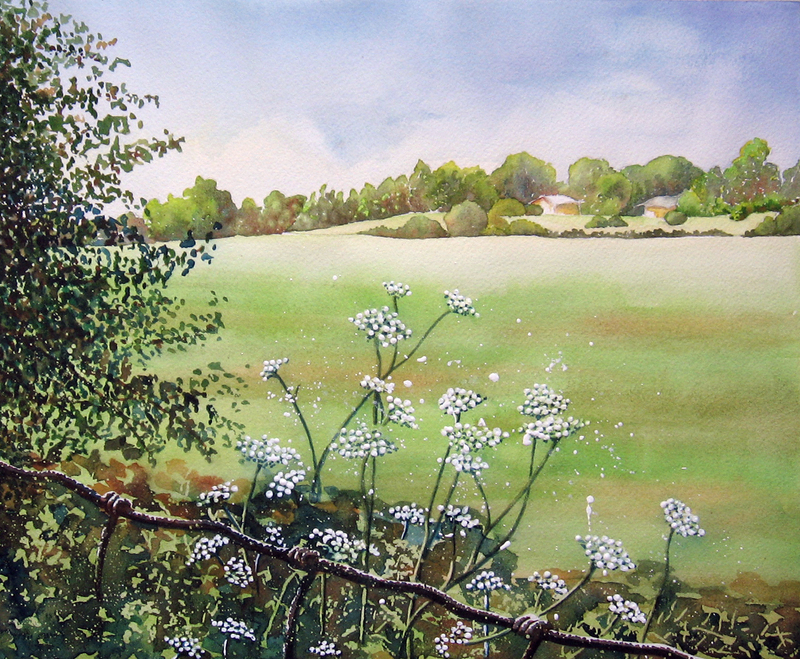 The queen Anne’s lace was dotted in and splattered using gesso. Every once in awhile I try something I see others doing. Thanks to Carol King’s workshop on Citra Solv collage papers made from National Geographics, I had some interesting papers to add to this project. Thank-you Carol! I have watched Isabelle post her muse collage work for a year, now, but not taken the time to try one myself. Last week I began visiting Ghadah at Pretty Green Bullet and was inspired by her loose ink drawings of figures and applications of collage. I thought I could try a little of both artist’s approaches. Thank-you Isabelle and Ghadah! As a theme, I chose to respond to a post that I thought very informative that Eva posted not long ago about the water cycle. Thank-you, Eva! 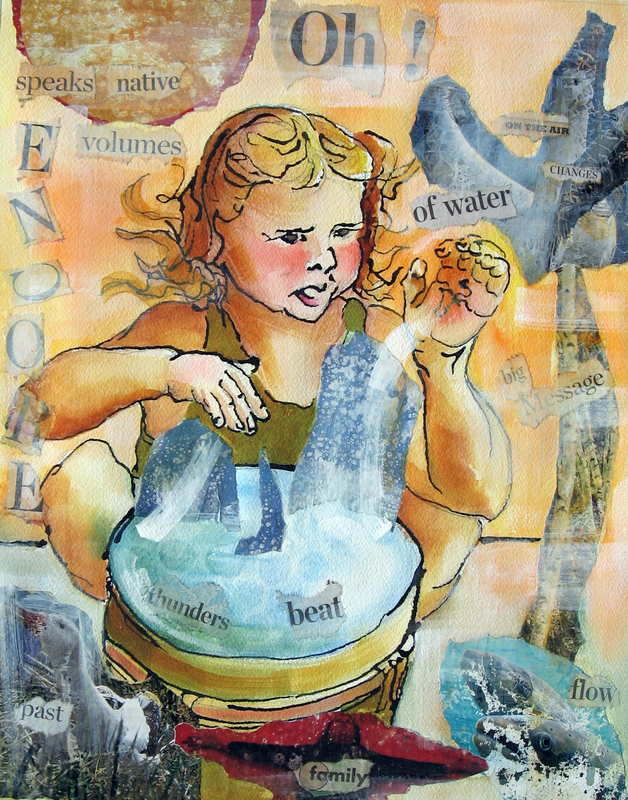 I used waterproof black ink, Citra Solv collage images, newspaper text, watercolor and gesso to create this. Beyond that, I will let the piece speak for itself. The above is the beginning of a painting that I used a mixture of sand and gesso on to add to the texture of a painting. I mix clean craft sand with white acrylic gesso and apply it to areas of my paper where I want to accentuate the texture. In the above image, you can see the mixture as foliage on the trees, not yet painted. In the lower portion, the lighter yellow, rough-looking areas are other areas of the mixture. 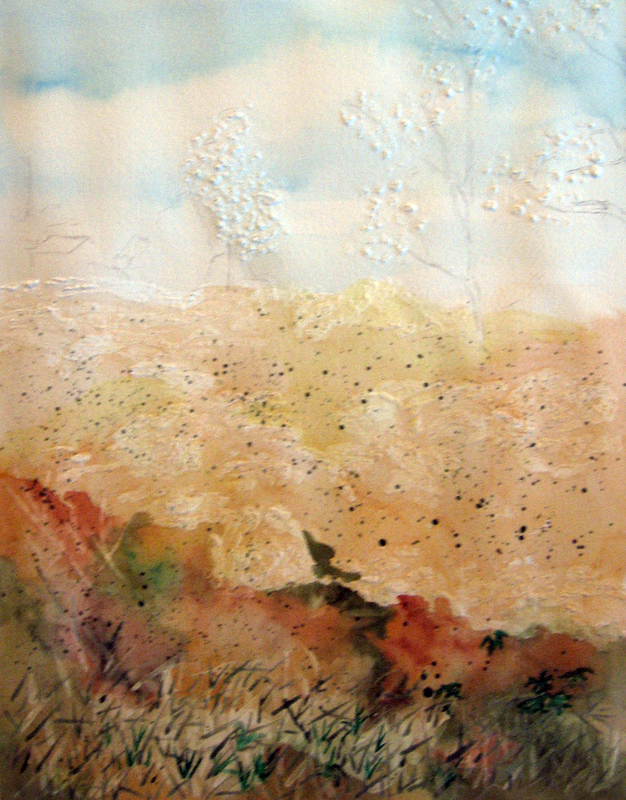 The light grasses along the bottom were painted with plain gesso, allowed to dry, and painted over with watercolor. 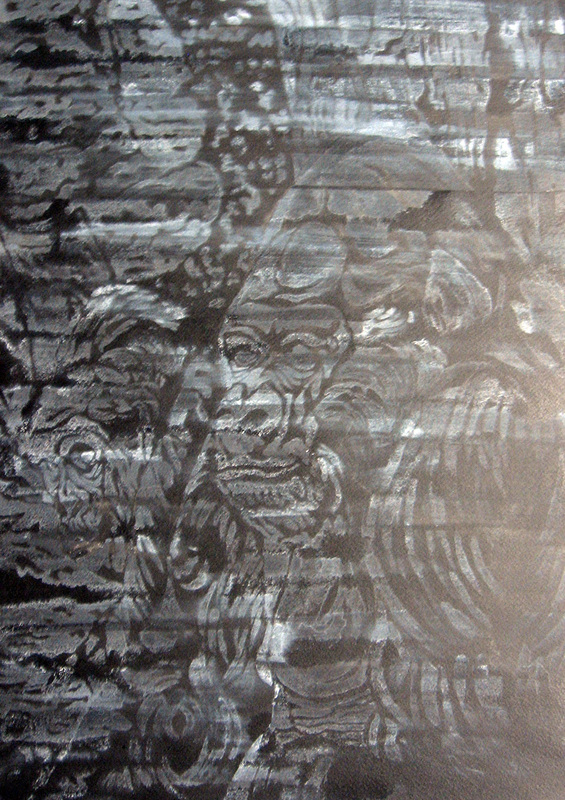 The gessoed areas usually appear lighter than the areas that are not gessoed. 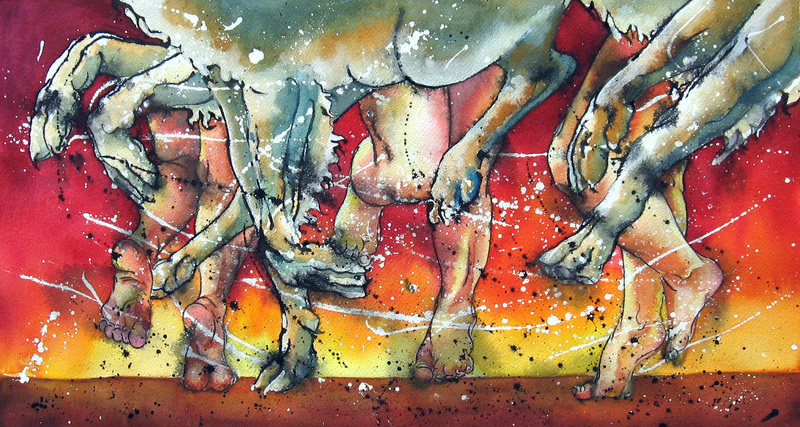 At this point, I splattered frisket and painted in some extra frisket grass blades along the bottom. I am always studying Chris Carter’s loose value paintings for anything I can pick up. I noticed in many of hers that she created a path of darks for the eye to follow. I attempted to set the values in this scene’s foreground, here. I was drawn to the way the darks wove through the wildflowers and other weeds. 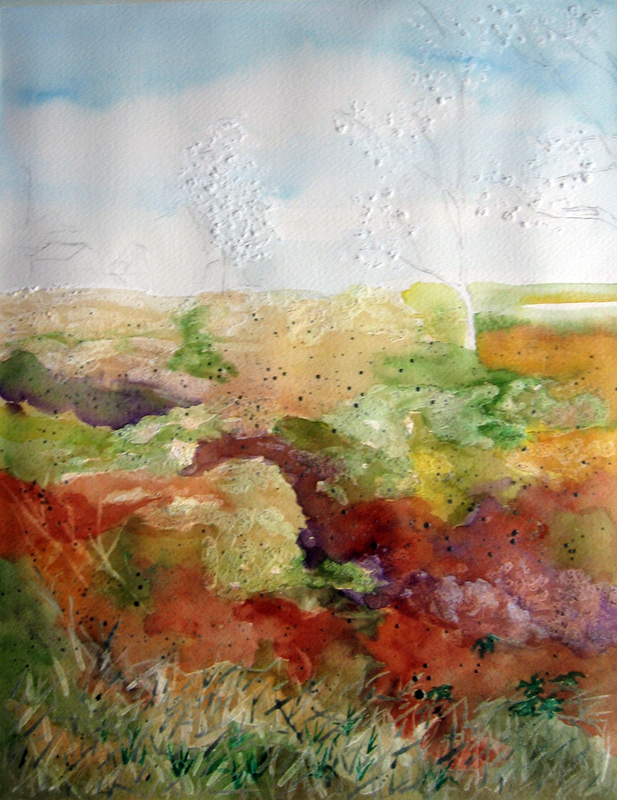 I also began painting more grasses and green leaves in the foreground. At this point, I decided what I wanted to accentuate in the painting. 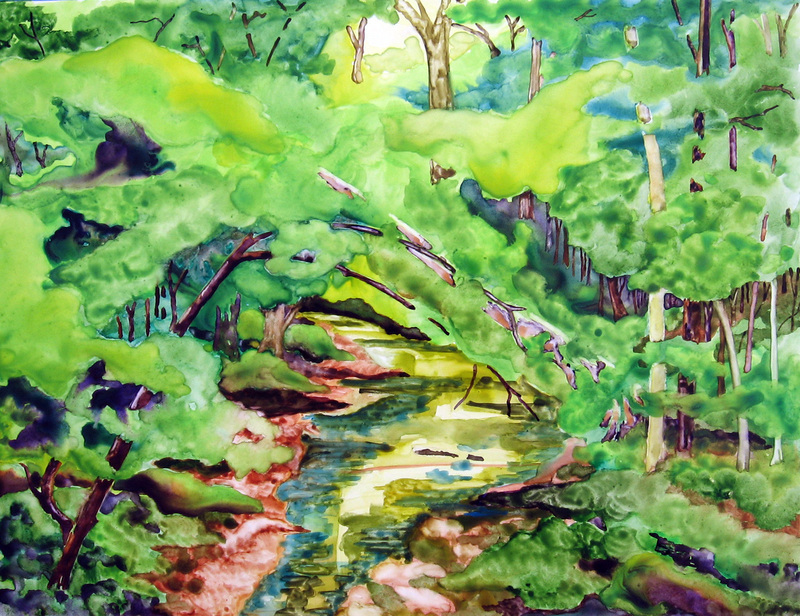 There was a long strip of light in the upper third of the painting that was blocked in by a treeline in the distance. There were also clumps of white wildflowers (not Queen Anne’s Lace) that twisted their way to that light area. 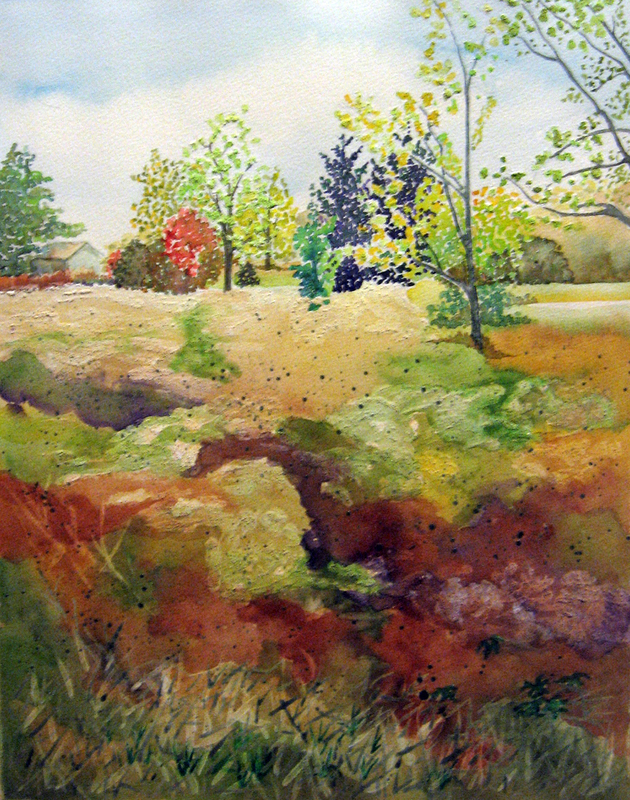 I painted the distant treeline and the leaves on the middle ground trees. This helped to act as a guide to balancing the foreground I had yet to do. In this step, I added the flowers in the scene. NO LIE! These flowers were really there! ( A big thank-you to Al for teaching me to be more aware of my surroundings!) 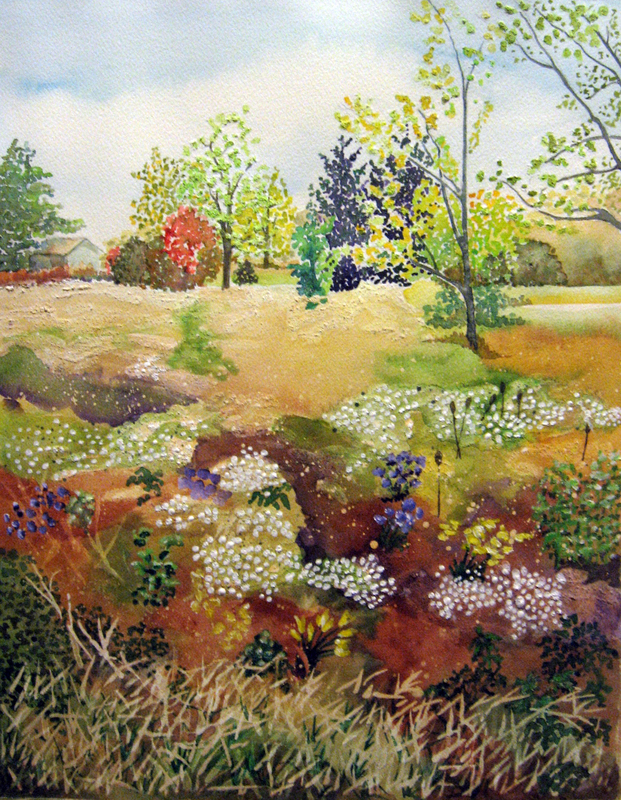 Where I had to add light value flowers over dark, I used white goache and added yellow or violet watercolor to it. The clumps of white flowers were dotted in with gesso and a brush. 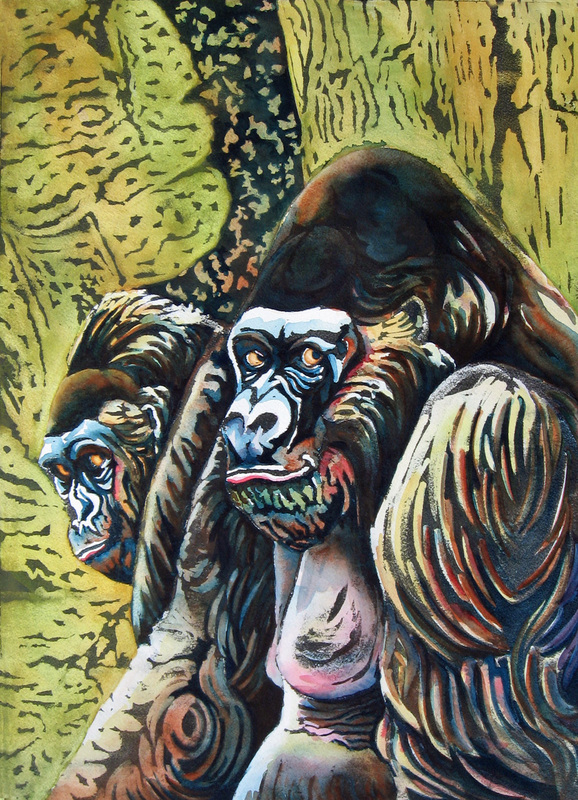 The frisket was removed and I touched up the values to finish the painting.